Azienda Agricola Venturini is located in San Floriano in the district of San Pietro in Cariano. It was established in 1963 continuing on the experience and love for the land that goes back for least three generations. The estate, located on the hilly area of the Valpolicella Classico, extends for 22 acres all planted to vineyards at an elevation of 800 feet above sea level. The vineyards enjoy a southwestern exposure and are planted on terraces held up by stonewalls called “marogne”. The vine training system is typical of the area: “simple” and “double” pergolas. 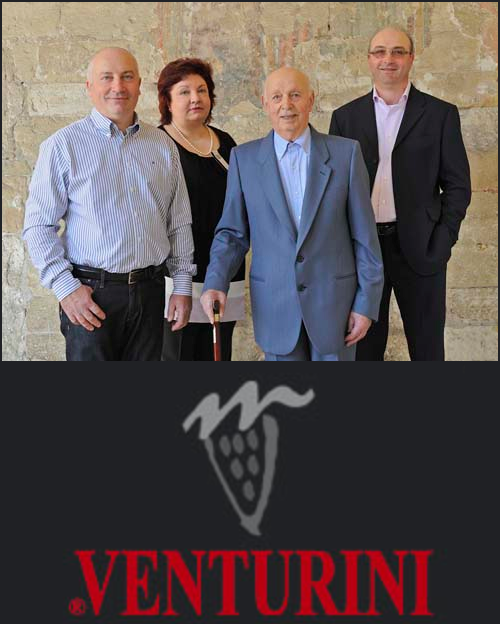 The winery is run by the Venturini family: father Massimino with sons Daniele, Mirco and daughter Giuseppina. Using only estate grown grapes: 70% Corvina Veronese, 20% Rondinella, 10% Molinara, the Venturini’s make high quality Valpolicella wines certified “Denominazione di Origine Controllata”: Amarone, Recioto, Valpolicella Classico and Classico Superiore. 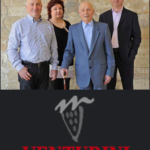 Careful selection of the grapes and vineyards has meant that the Venturini’s have produced several “cru” wines that lake their name from the estate on which they were made: “Semonte Alto”, “Le Brugnine” and “11 Castelliere”. The Romans applied the term Rhetic to the wine coming from the area around and to the south of Lake Garda but the beverage highly praised by Pliny the Elder, Virgil, Martial and Suetonius was quite clearly the wine known today as Valpolicella. That wine, named for the valley situated to the north of Verona, which is today the center of its production, is different from those made in other areas strongly influenced by the mild climate produced by the water of Lake Garda in that it has a bigger body and a more intense color. A great part of Valpolicella’s worldwide reputation, however, must be attributed to two versions of the wine, the Recioto and Recioto Amarone. In making them, grape clusters are carefully selected and then dried, after the harvest, for a period varying between 30 and 90 days. Pressing and fermentation occur at times, under environmental conditions and according to methods that are different from those of the normal Valpolicella. In addition, the wines’ degree of sweetness can be altered by moving the first racking forward or back in time. The Amarone is differentiated from the Recioto by the fact that all of its sugars are transformed into alcohol. That factor, along with the concentration of the must through the drying of the grapes and aging in oak casks for at least one year, is responsible for the development of exclusive characteristics that set this wine apart from all others. Amarone della Valpolicella Classico "Riserva"
Amarone della Valpolicella Classico, "Campo Masua"